Conversations with the very admirable Zainab Salbi led to the 'Remember Me' collection. Sadly the ongoing suffering of families in Iraq and Afghanistan are marginalised, as they are no longer news. This collection is a poignant reminder. The pouches were made from Najaf fabric from Iraq, and stitched together in Iraq, with a small silver token with the work 'Uthkununi' or 'Remember me' in Arabic. 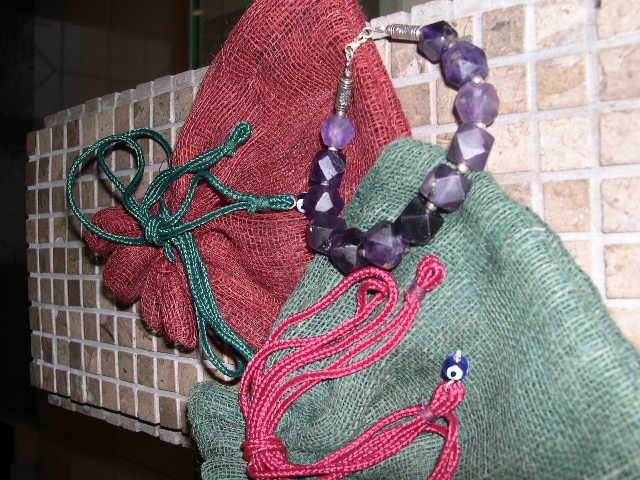 The bracelets within the pouches were made by ladies in Afghanistan. This project was done for a fundraiser in Washington DC organised by Women for Women International. We are delighted that we could contribute in our small way.